It's been too long since the last posting. One of the god things about a blog is lots of new information, one of the bad things is putting all that new information up for you all to read and care about. I'll just pop in to say that the next seminar is with Sensei Chuck Nuccio in Pleasantville New York. I've trained at Chuck's dojo, it's a great place, he's a great guy. And of course the inimitable Taira Sensei will be there to bring you all to a new level. It's been a couple of months since I trained with Taira sensei, but the reports from Lithuania and San Diego are that he's progressed his teaching yet again since Paris. 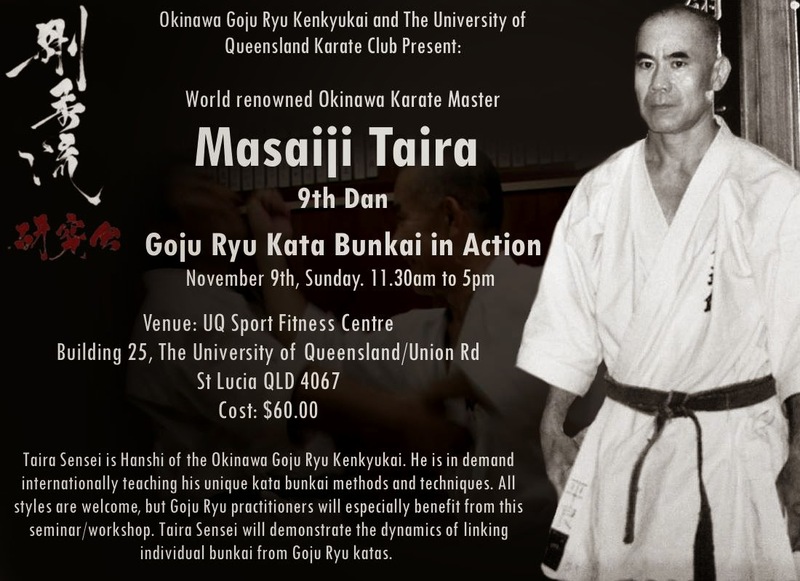 We've said it before - train with Taira Sensei as often as you can so that you don't spend the first day going "what???? what's he doing now????" He challenges you in the most important muscle: your brain. Sessions don't kill you with thousands of punches and kicks, you can do that by yourself. He takes your mind outside it's comfort zone. That's why we do this isn't it - to challenge ourselves? After New York there's New Zealand 1/2/3 Nov and Brisbane 6/7/8 Nov coming up.